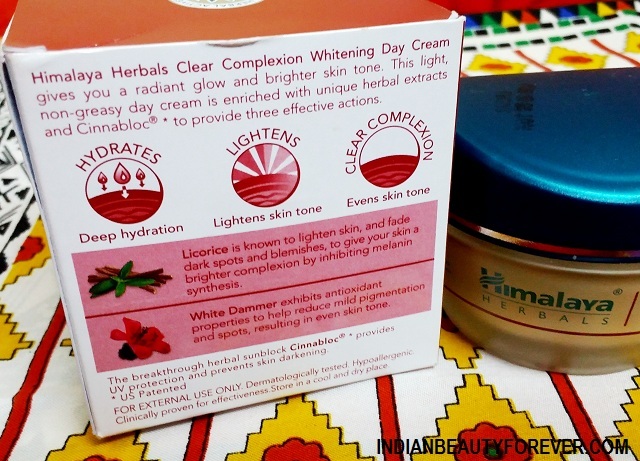 I will review the new Himalaya Herbals Clear Complexion Whitening Day Cream. This cream has been used by my brother as he was looking for a new day cream. So, this review comes from him. I am using the gel cream which is oil free that I will be reviewing in a few days. Let’s get to know if the product is a hit or a miss. The breakthrough herbal sunblock CINNABLOC™ provides UV protection and prevents skin darkening. Licorice is known to help lighten skin and fade dark spots and blemishes, to give your skin a brighter complexion by inhibiting melanin synthesis. White Dammer is a rich source of flavonoids and phenols which exhibit potent antioxidant activity. It helps reduce mild pigmentation and spots, resulting in an even skin tone. Apply Clear Complexion Whitening Day Cream gently over face and neck twice daily, after cleansing. For best results, use regularly. Clear Complexion Whitening Day Cream is dermatologically tested, non-comedogenic, free of mineral oils and parabens, and hypoallergenic. The cream comes in a very heavy glass tub pack with a greenish cap. I am not a fan of such packaging since they are a bit unhygienic and the fact that once the bottle is dropped this can get shattered. This is one issue that I have with such glass bottles as when you apply cream the hands gets greasy thus chances of accidental dropping becomes high. The cream is pale creamy in color and has a nice subtle floral-ish smell to it. The smell isn’t overpowering but decent as I really don’t like skin care products with excessive fragrance. This is not a heavy cream but a cream with a light feel and texture. I like that this gets absorbed into the skin really well and leaves no excessive shine or greasiness behind. 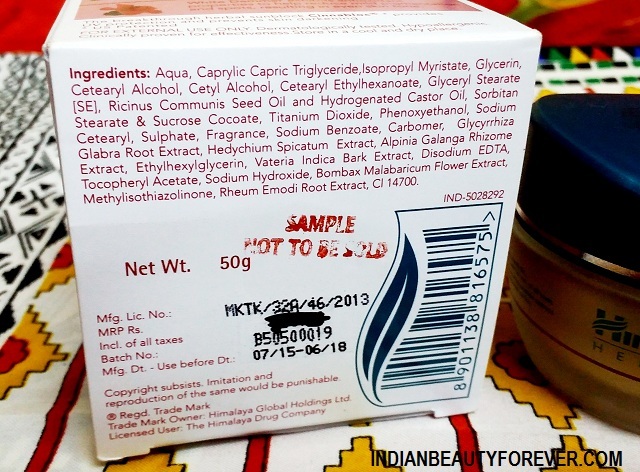 The cream has key ingredients as Licorice that is a potential skin lightening and whitening ingredient. This also fades dark spots and blemishes, to give your skin a brighter complexion by inhibiting melanin synthesis. White Dammer is a rich source of flavonoids and phenols that are powerful antioxidants which help the skin stay younger a lot longer by reducing the oxidative stress. This also lightens any mild pigmentation and spots, resulting in an even skin tone. The cream has been used by my brother for around a month since I got this. I liked that a little bit of this is enough for one time usage thus the product is quite affordable as this pack will last for around 2 months therefore for 250 rupees it’s a good buy. Ever since he has been using this cream. This has shown some noticeable results like the sun tanning on his face has been reduced. There were some marks left behind by the pimples on his cheeks which are also lightened. Another thing that he was concerned about if the product causes any acne or greasiness but there was none. He had acne but he said they were there even before using this cream. 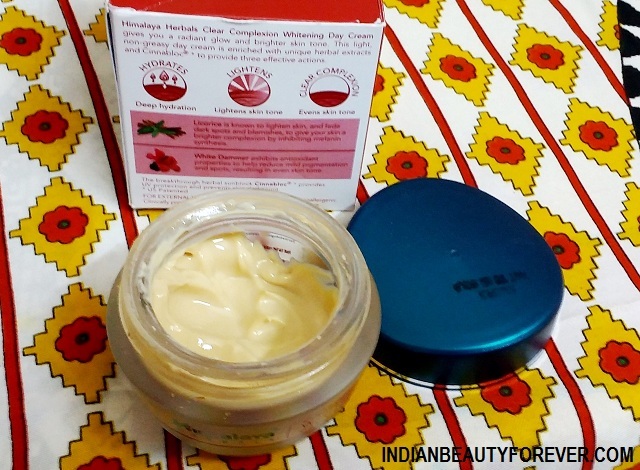 Thus the cream can be used by oily to combination skinned ones as well. 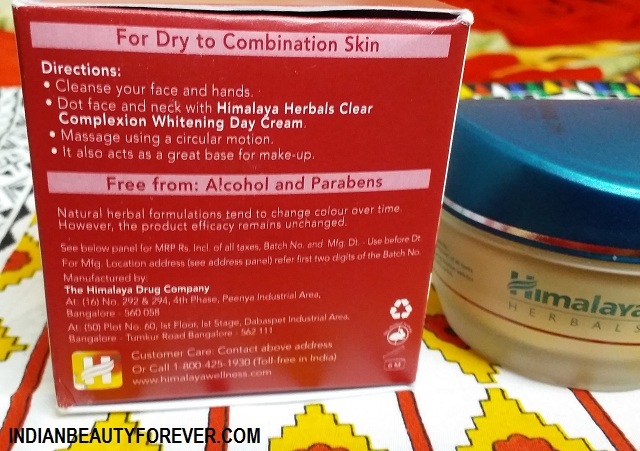 For the dry skin, I think the cream can be used in the summers but not in winters when the skin needs more hydration. 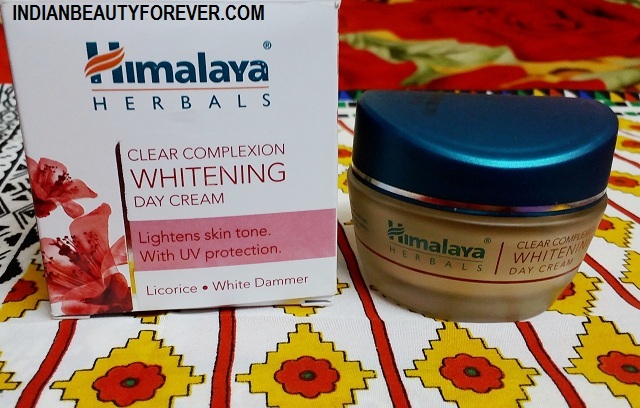 Take: Himalaya Herbals Clear Complexion Whitening Day Cream is a decent cream that works to reduce the sun tan and the acne marks to some extent. The non greasy texture is light and gets into the skin easily and gives a slight glow on the face. I will recommend it. Sounds quite good for summer and it is really nice that it works on removing tan and spots.